Since coming home for the summer, the rumors have been flying. Meeting over coffee or a local microbrew with pastors, curial staff, and local ecumenical leadership over the last several weeks, the two consistent questions have, “So, what is it like living in Rome?” and, “Who do you think the new archbishop will be? Have you heard any rumors over there?” A month ago, even the current AB was asking me the same questions, and not in that order. This morning’s announcement came to me by text while I slept, out of town and disconnected from the internet. To be honest, it was also a bit of a surprise. So far, all I know about J. Peter Sartain is what I have read online (now that I have found a connection) and unsurprisingly the writer with the most to say about it is Rocco Palmo at Whispers in the Loggia. Even as recently as Tuesday, folk here were still in the dark. Archbishop Brunnett had been out of town for his brother’s funeral, and though we have been anticipating the announcement shortly after Bishop Cupich’s Sept 3 installation in Spokane, Sartain’s name never seemed to be on anyone’s list. The favorites have been bishops like George Thomas, Gerald Kicanas, and, until the incident with the hospital administrator, Thomas Olmstead. Blase Cupich had been among them until tapped for Spokane. 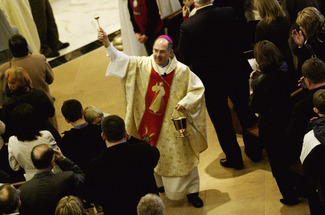 Sartain is a native of Memphis, and has served as bishop of Little Rock, AR, and Joliet, IL. The hope for either a native Washingtonian or at least someone from west of the Rockies is again delayed, but most see the South and the Midwest as a better starting point than the East Coast (which, from here, starts at the Mississippi) considering the vast ecclesial and cultural differences at work. We are church in one of the most unchurched regions in the country. The fear of being run through the ringer again is felt even outside the Catholic community. One of the alternative weeklies, The Stranger, ran an article on their Slog yesterday asking, “Will Seattle’s Next Archbishop Be an Anti-Gay Doctrinal Conservative?” That should say something about the challenges our new bishop will face. The question is, as another blogger put it, how to be true to the faith without effectively becoming “Attila the Hun”, real or perceived. At the same time, between new generations growing up without these memories and significant numbers of immigrants from out of state and out of the country, other concerns weigh as heavily. For more than a generation, the number of lay ecclesial ministers have outnumbered priests in parishes, and the diaconate is now equal in number to the diocesan presbyterate and growing, while the later relies heavily on help from religious communities and foreign externs. Many are asking what the archbishop-elect’s experience is with creative ecclesial leadership. More than thirty languages are used in the celebration of the Eucharist on a weekly basis, and nearly half the population of the archdiocese is Spanish-speaking. So is Bishop Sartain, apparently. Seattle-area Christians have a long and strong history of ecumenical cooperation, though it has been more focused on social justice advocacy than on intentional ecumenism, ie the goal of Christian unity. Being religious in an overwhelmingly non-religious environment, interreligious dialogue is critical. At the same time, and indeed as an integral partner with dialogue, evangelization both “old” and “new” is a high priority. Like anywhere in the U.S., we have a polarized church, with some groups of priests unwilling to even talk to others, the parishioners falling prey to the hyper-dichotomized political situation and bringing it into the pews. There have been situations where the pastoral staff of a parish, theologically educated and ecumenically involved, comes under fire from the lay leadership which is more likely formed by EWTN and pop apologists (or vice versa). I once had a parishioner approach me, grateful for my presence as pastoral associate in the parish because, she said, “all the other parish staff in this deanery are pro-choice, and it is nice to have a pro-life person in charge!” Knowing most of my ministry peers, it was difficult to see how anyone could read them that way, but it is indicative of the tensions and mistrust in too many situations. Another time, a school parent and faith formation commission member told me they had a great pastor, but that the staff undermined his prophetic, orthodox teaching – unaware, apparently, that the pastor had hired each one of the staff to be collaborators with him in ministry to the parish, and fully supported their ministry. A third example came at the first meeting of a JustFaith group, when a parishoner introduced herself as “probably not belonging here, since [she] was a Republican” – as if Catholic Social Teaching depends on one’s political views! It will be an interesting time for our Archbishop-elect, and I look forward to hearing more from and about him. As I learn more, I will share it! Please keep him, me, and all the People of God in Western Washington in your prayers! By A.J. Boyd in Church and World, Pacific Northwest on September 16, 2010 . Yes, I will. And I pray that our new Metropolitan may find in the denominational and ecumenical leaders of our State, colleagues with whom he can colaborate and seek support from in good conscience.